Here’s something interesting. The developers over at PocketBook ported a version of the video game Doom 2 to run on an updated version of the PocketBook 360, called the PocketBook 360 Plus. Information about the PocketBook 360 Plus is scarce at this point, but the video below shows some of its potential. It is presumably equipped with an E Ink Pearl screen and a new Freescale processor to achieve frame rates for video games. This is similar to the video that Bookeen posted a couple months back where they managed to get video to play smoothly on a Pearl screen. 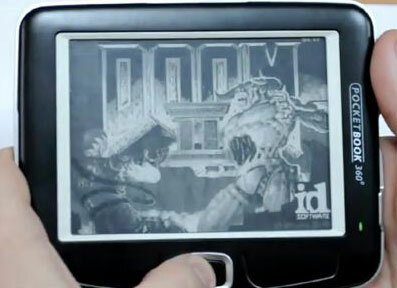 Running shooter video games like Doom 2 on an E Ink ereader isn’t something that is going to be practical, but it is good to see E Ink advancing in potential for future applications. Something like this could be applied to E Ink’s new Triton color display technology with greater benefits down the road.